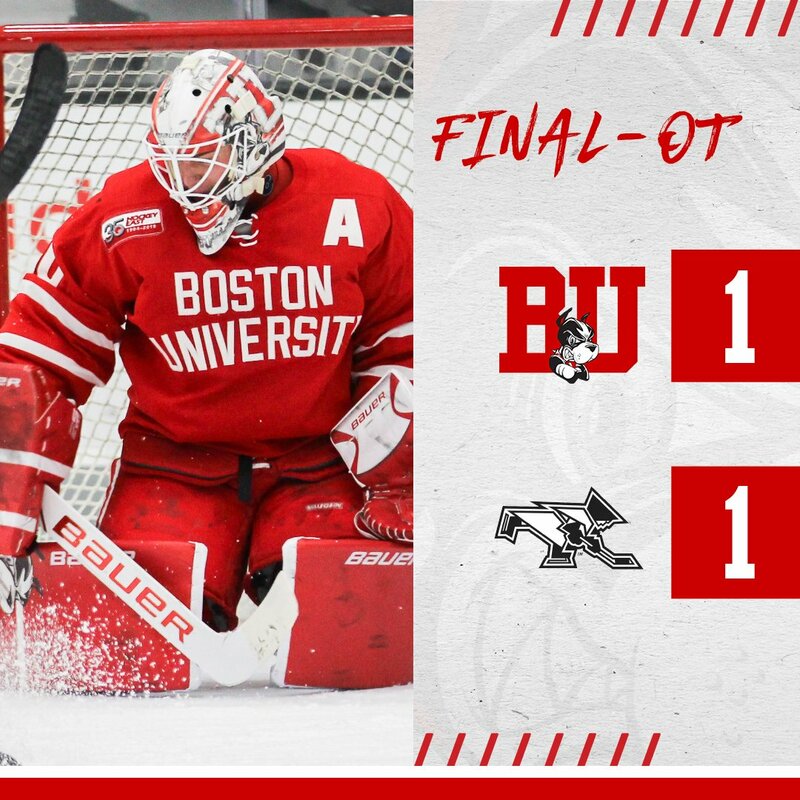 Jake Oettinger stopped 45 shots as BU played #8 Providence College to a 1-1 overtime tie at Schneider Arena last night. Goal scorers were Shane Bowers for the Terriers and Jack Dugan for the Friars. With the tie, BU has sole possession of fifth place in Hockey East, two points behind Lowell and Northeastern who each have a game in hand on BU. In the game’s first minute, Chad Krys got behind the PC defense on the rush, deked goalie Hayden Hawkey, but his backhander went off the post. While Providence dominated shots in the period, BU drew first blood on an odd-man rush at 7:25. Hawkey saved Joel Farabee’s shot from the right dot, but Bowers converted the rebound from the left post for a 1-0 lead. Patrick Curry had the secondary assist. Providence also dominated the second period with a 14-6 shot advantage, but neither team could find the back of the net. Providence finally scored the equalizer at 12:31 of the third period on its 35thshot of the game. Jack Dugan got behind a step on Krys, took a pass from Greg Printz and backhanded a shot through Oettinger’s five-hole. Continuing the pattern of the first three periods, PC dominated overtime with five shots to BU’s one, forcing some strong saves by Oettinger. Coach Albie O'Connell was pleased with BU's quick start in the first period, noting, “I think we were mentally…and physically ready to go. We got off to a really good start – that gave us a chance to get a goal." But, he conceded, "as the game wore on, we wore down," and added that the Friars "did a really good job of getting in, fore-checking, and holding pressure." "We were fortunate to get out with a point," O'Connell said. "Our goaltender was the story. Jake was lights out." ►Terriers took no penalties in the game. Assistant Athletics Director Brian Kelley pointed out that had last happened in a January 2008 game against Dartmouth. Former Terrier captain and U.S. Olympic captain Mike Eruzione guested on The Mike Lupica podcast and looked back at Team USA’s gold medal performance in the 1980 Olympics, 39 years ago. Former Terrier skater and longtime Vermont Coach Jim Cross has been named as the 2019 Legend of College Hockey by the Hobey Baker Memorial Award Foundation. Cross, who played for the Terriers’ 1960 Frozen Four squad, coached the Catamounts for 19 seasons, compiling a 280-251-9 record. Other Terrier recipients of the Legends Awards are former BU head coaches Jack Kelley and Jack Parker, and Bill Riley, Jr., a linemate of Parker and later head coach of UMass Lowell. 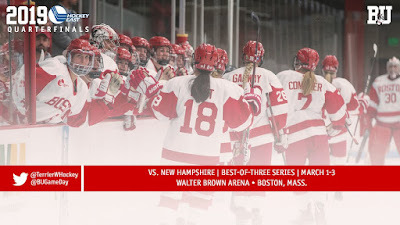 #8 Terriers begin their quest for the Hockey East championship, hosting New Hampshire in a best-of-three-quarterfinal series. The series will be live streamed on FloHockey.tv(PPV). All three regular-season contests between BU and UNH were close games, with BU winning twice, 3-2, and 2-1, and tying once, 3-3. BU’s attack is led by sophomore Jesse Compher with 55 points and red-shirt junior Sammy Davis with 47, including a team-best 23 goals. Sophomore Corinne Schroeder has a 1.85 goals against average. Davis was named Hockey East Player of the Month for February. Her 14 points (6G, 8A) helped BU to a 5-1-2 record for the month.